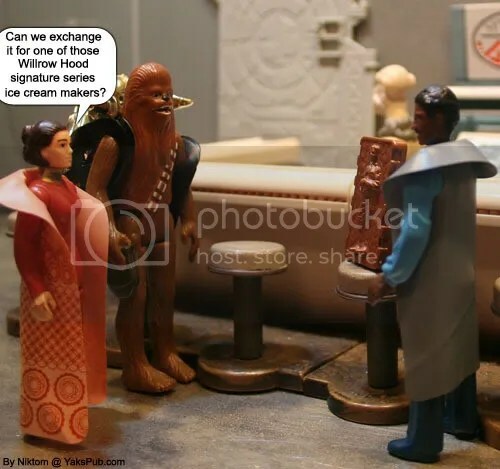 Yeah,hiliarious post,but why would they want an ice cream maker instead of a small block of carbonite? Fett dude your naievity is sometimes as hilarious as the skit. So what IS that little Han in carbonite, anyway? Is it a custom piece, or from something? That is from the Vintage Micro Collection line. They are made of diecast metal and average 1.5 to 2 inches tall. Here is shot of all the figures from the line. Huh… never really thought about that. My guess is they did it since the other Han figure has the binders and the main feature of the playset involves switching the two. Hey,a bit off topic,when Han is unfrozen in ROTJ,take a look where his cuffs would be…They dissapeared!! !Back in ESB,look at him frozen in carbonite,the cuffs aren’t there too!!!! That’s because the cuffs were taken off just before he was lowered into the freezing chamber.